This coming Saturday, 27th April, we are running an ‘In Conversation’ event at The Bowes Museum as part of the activities around the SOLD! exhibition – the exhibition closes on 5th May, so still time to see it. Phillips of Hitchin shop, Hitchin, c.1905. Digital copy of glass-plate negative courtesy of the V&A Museum. Phillips of Hitchin were established in 1884 and remained as a family business until Jerome Phillips, the grandson of Frederick W. Phillips the founder of the business, retired in 2016. I’ll be ‘In Conversation’ with Jerome at the event at The Bowes Museum this Saturday, talking about Jerome’s life as one of the countries leading antique dealers, and about the history of his business, Phillips of Hitchin. Hope to see you on Saturday at The Bowes Museum! Tags: Bowes Museum, In Conversation, Jerome Phillips, Phillips of Hitchin, SOLD! 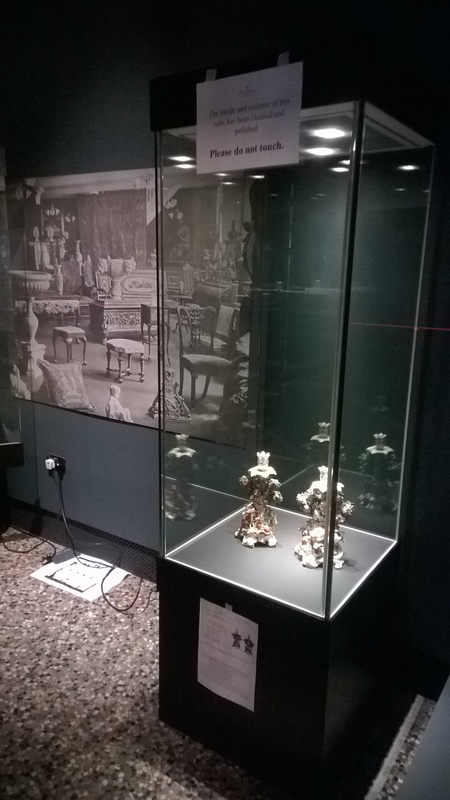 We finished the install on our new exhibition on Antique Dealers – called ‘Antique Dealers: Buying, Selling and Collecting‘ at the Stanley & Audrey Burton Gallery at the University of Leeds – all ready for the opening at 1.00pm on MONDAY 4th March. This show runs until 25th May, so there’s plenty of time to see it – and it’s FREE. The theme of this exhibition is on the same subject – antique dealers – but this one has a narrower focus than the SOLD! exhibition at The Bowes Museum. 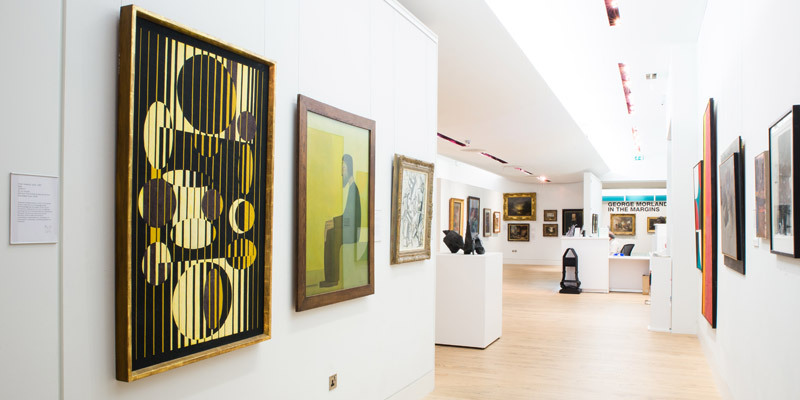 I’ve decided to focus on the personalities of three of the most well-known dealers and antique dealing businesses of the 20th century – Phillips of Hitchin (established in 1884); Ronald A. Lee (established in 1949) and Roger Warner (established in 1936). 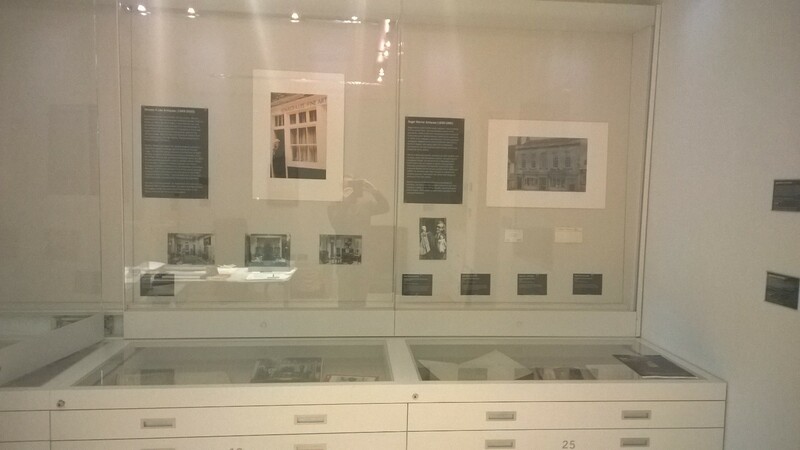 Below is a photograph of the R A Lee and Roger Warner sections of the exhibition, with a display in the glass cases of parts of the Lee and Warner archives, as well as some photos of the respective shops of Lee and Warner; and some associated business ephemera. The Antique Dealers Exhibition at the Stanley & Audrey Burton Gallery at the University of Leeds. 2019. 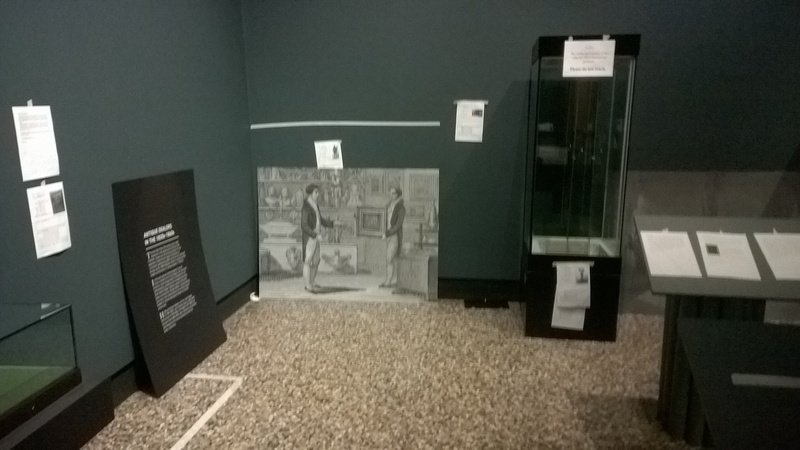 We also have dealer objects in the exhibition of course – and here’s a photograph of one side of the Antique Dealers exhibition with, left to right, a pen and ink drawing by Anne Webb of the library at Garnstone Hall in 1840, given to Temple Newsam, Leeds Museums by Roger Warner on his retirement from business in 1985; an 18th century chimney board, a bequest in 2008 to Temple Newsam, Leeds Museums, from the estate of Roger Warner (1913-2003); and the early 19th century stool by C.H. Tatham, sold to Temple Newsam by Ronald A. Lee in 1975. The small arched-top framed ‘picture’ is actually a set of 18th century decorative silk trimmings (passementerie) also part of a bequest from the estate of Roger Warner in 2008. 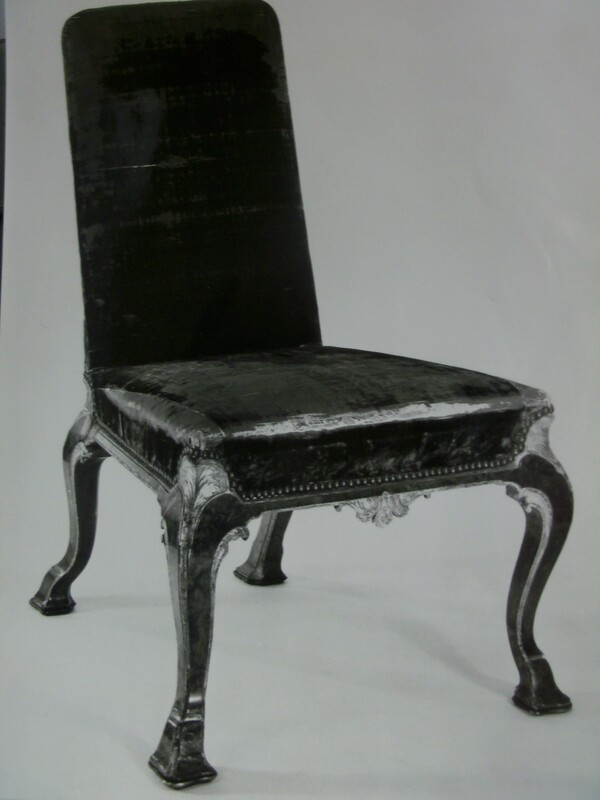 And finally the 18th century chair from Houghton Hall, Norfolk, sold to Temple Newsam by Phillips of Hitchin in 1960. The display of dealer objects at the Stanley & Audrey Burton Gallery exhibition on Antique Dealers. 2019. 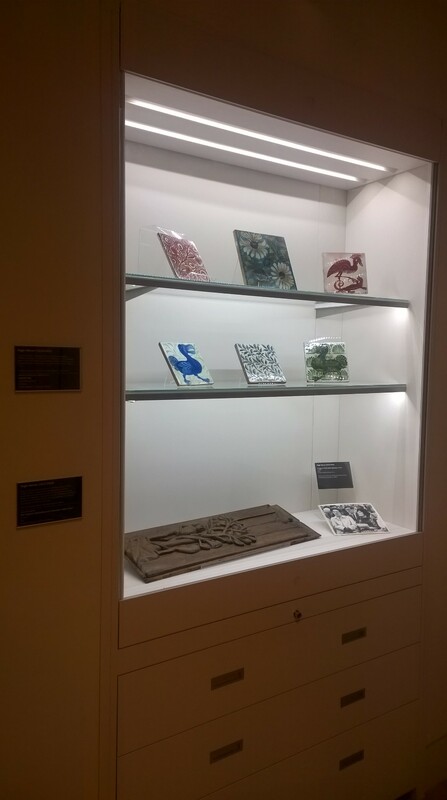 There are also a range of objects on loan from the private collections of the Warner family – the photograph of the display case below shows a selection of 19th century tiles by the Arts & Crafts designer William de Morgan (1837-1917) – Roger Warner’s grandfather was Metford Warner (1843-1930) the owner of the wallpaper manufacturer Jeffrey & Co., who produced the wallpapers for the Arts & Crafts designer William Morris for his company Morris & Co. It’s thought that the tiles on display may have been passed directly down from Metford Warner through the family to Roger Warner – they are now owned by Simon Warner, Roger’s son – and thanks again to Simon for generously loaning them to the exhibition. The other object in the glass display case is a 15th or early 16th century oak fragment, carved with a depiction of Adam & Eve – also from Roger Warner’s private collection, and now owned by Simon Warner; and a photograph of Roger Warner at one of the Country House auctions he regularly attended during the 1950s and 1960s. Roger Warner objects on display in the Antique Dealers exhibition at the Stanley & Audrey Burton Gallery, Leeds. 2019. 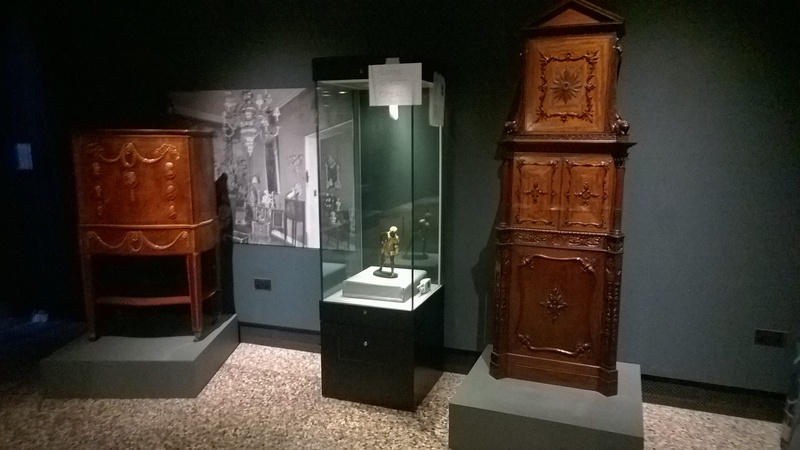 There are many other fascinating objects and archives on display, so I hope you get a chance to pop to the University of Leeds to see the Antique Dealers exhibition. Thanks are due to my co-curator Katie Herrington and to Fred, Eugenie, Laura and the rest of the team at the Brotherton Library Special Collections and the Stanley & Audrey Burton Gallery. And thanks too to the Leeds Art Fund for so generously supporting the exhibition. We are planning to run some events during the run of the Antique Dealers exhibition at the Stanley & Audrey Burton Gallery at University of Leeds…I’ll update the blog with details of those once we’ve finished planning them all! 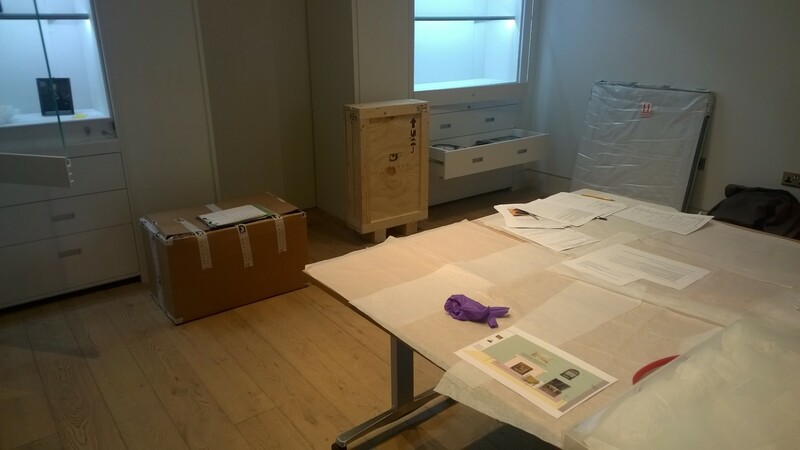 The ‘Antique Dealers; Buying, Selling and Collecting’ exhibition at the Stanley & Audrey Burton Gallery at the University of Leeds is starting to take shape – we’re just doing the final install this week, and the object loans from Temple Newsam, Leeds arrived yesterday. It’s very exciting seeing this exhibition develop – especially as I now feel like an old hand at exhibitions, having done the SOLD! exhibition at The Bowes Museum. The Leeds exhibition is on a much smaller scale – only about a dozen or so objects, but it will, I hope, be just as engaging, and I hope will also foreground the amazing antique dealer archives we have at the Brotherton Library Special Collections. 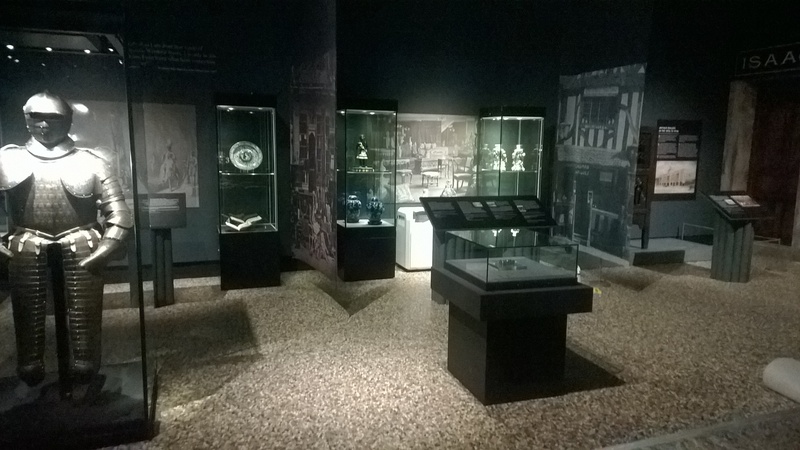 The objects from Temple Newsam are being placed back into a dialogue with the original archives from the three of the dealers that are the focus of the exhibition at Leeds – Phillips of Hitchin, Ronald A Lee and Roger Warner. Here’s the first of the Temple Newsam objects arriving at the gallery. Antique Dealers Exhibition at Leeds University – the packing crates arrive. The story of the exhibition is on antique dealers buying and selling antiques, and of course and perhaps inevitably, dealers as collectors of antiques – we are using Roger Warner as a key example of the dealer/collector and have been lucky to have a number of objects loans from the private collections of Roger Warner’s family, Sue, Simon and Deborah. Here are a few of those objects, just being installed into the display cases at the gallery – a 19th century mousetrap and an 18th century teacaddy from the collections at Temple Newsam, and some wonderful small objects from Rogers’ personal collection. Roger Warner objects at the Leeds University exhibition. We also have an early 18th century chair from Houghton Hall, Norfolk, one of a set of six chairs that Phillips of Hitchin sold to various museums in 1960 – the Temple Newsam chair retains an 18th century green velvet cover. Phillips of Hitchin chair unpacked and ready for placing in the exhibition at Leeds University. 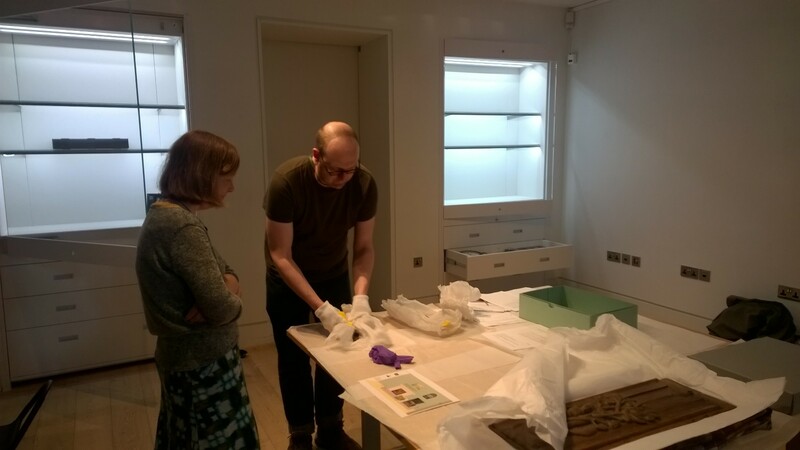 The install is going well, and Katie Herington (my co-curator on this exhibition) together with Fred, our amazingly helpful gallery technician, and Jill and Laura, have been busy unpacking and placing the objects in the space. Jill and Fred unpacking objects for the Leeds University exhibition. 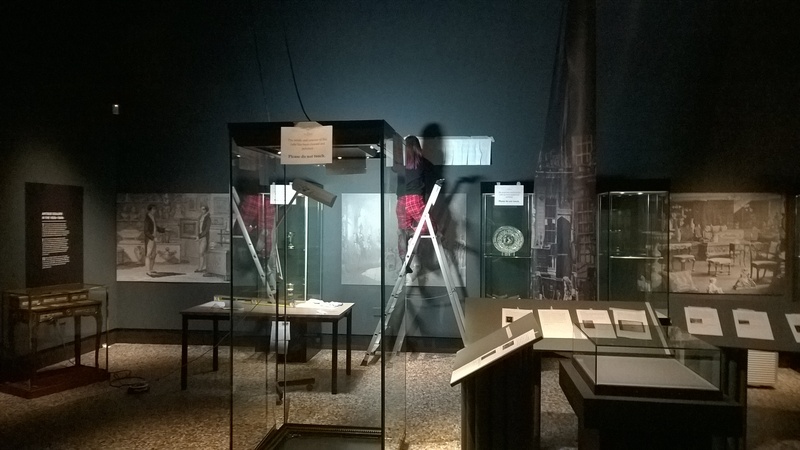 Katie placing the 18th century chimney board in the Leeds exhibition. There’s still lots to do of course, and we are waiting for Eugenie from the Brotherton Library Special Collections team to come by tomorrow to begin to place the antique dealer archive material in the display cases. We have some fantastic antique dealer archives in the exhibition, including some very early stock books, dating from c.1890 from Phillips of Hitchin archives; a fascinating sales book of the 1920s of the dealer H.M. Lee, Ronald A Lee’s father; and Roger Warner’s first sales book from 1936. As well as a range of intriguing photographs of the dealers’ shops and of their stands at the world-famous Grosvenor House Antiques Fair from the 1950s and 1960s. I hope that the ‘Antique Dealers’ exhibition at the Stanley & Audrey Burton Gallery will prove to be a success – there’s been a lot of work by a lot of people in the Brotherton Team and the Stanley & Audrey Burton Gallery to make this happen. I’ll post another blog once the exhibition install has been completed, so you can see what it looks like – it opens on MONDAY 4th March and runs until 25th May 2019 – and it’s FREE! The SOLD! exhibition at The Bowes Museum is going very well; we’ve had lots of very positive and encouraging comments and visitors seem to like the Show – it’s running until the 5th May, so there’s still plenty of time to see the exhibition. But I also thought you would like to know of my parallel exhibition, due to open very soon at The Stanley & Audrey Burton Gallery at the University of Leeds – I’m keeping myself busy! The Stanley & Audrey Burton Gallery, University of Leeds. Photograph, copyright University of Leeds. – it’s a great space – although we are only going to be using the Education Room Space in the SABG as it’s a much smaller exhibition, but I still hope that it will draw further attention to the significance of the history of Antique Dealers to British cultural life. I’m still finishing the Text Panels and the object labels for this one, but they will be all ready for the printers this coming week. The Antique Dealers exhibition is focused on the extraordinary range of antique dealer archives that have been so generously donated to the Brotherton Library Special Collections at the University of Leeds. As you may know, we have several highly important antique dealer archives at the University of Leeds library – including the archives of Phillips of Hitchin, Ronald A. Lee, Roger Warner, and H.C. Baxter & Sons. We’ve focused on just three of the archives for the Antique Dealers exhibition at the University – those of Phillips of Hitchin, Ronald A. Lee and Roger Warner – and have brought a few objects that the dealers sold to Temple Newsam, Leeds, back into dialogue with the original archive material. Just to whet your appetite here’s a few examples of the objects coming on loan from Leeds Museums & Galleries to the Antique Dealers exhibition at the SABG in Leeds. From Temple Newsam, this historically important early 18th century side-chair from Houghton Hall in Norfolk, sold by Phillips of Hitchin to Temple Newsam in 1960. Early 18th century Walnut side chair, sold by Phillips of Hitchin to Temple Newsam, 1960. Photograph from the Phillips of Hitchin archives, BLSC University of Leeds. Painted stool designed by C H Tatham, c.1800; sold by R.A. Lee to Temple Newsam in 1975. Photograph Leeds Museums & Galleries. We have also had an extraordinary range of objects on loan from the private collections of the Warner family – from Simon Warner, Deborah Warner and Sue Ashton, the son and daughters of the well-known antique dealer Roger Warner (1913-2003) – these are some wonderfully ‘curious’ objects that remained in Roger Warner’s collection until he died in 2003. 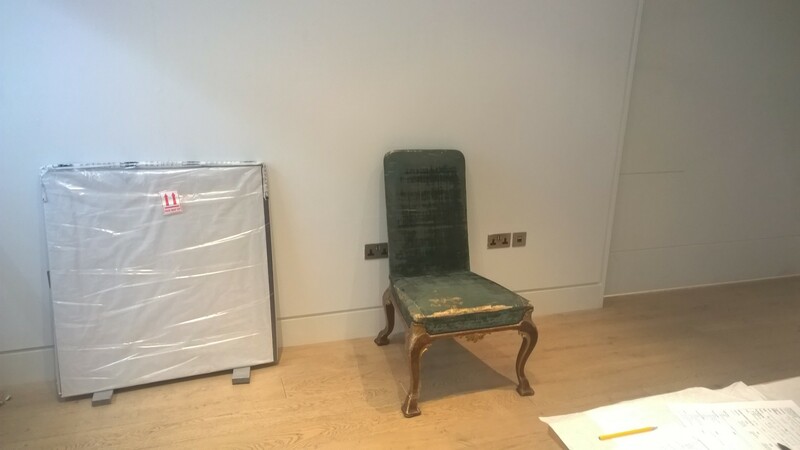 We are so grateful to the Warner family for so generously loaning the objects that formerly belonged to Roger Warner – and especially to Simon Warner for so kindly delivering the objects to the University! I’ll update the Blog on the progress on the exhibition in the coming week – and hope that people get a chance to see the new Antique Dealer exhibition at the Stanley & Audrey Burton Gallery, University of Leeds during the period it is on – 4th March to 25th May 2019 – it’s a FREE exhibition! SOLD! has officially opened at The Bowes Museum thank you to everyone involved in what has been an enormously enriching and enormously enjoyable experience! It was the preview night on Friday evening and we seemed to have a good crown of people, many of whom had made a special trip from London and the South – thank you to all that made the occasion so special. SOLD! 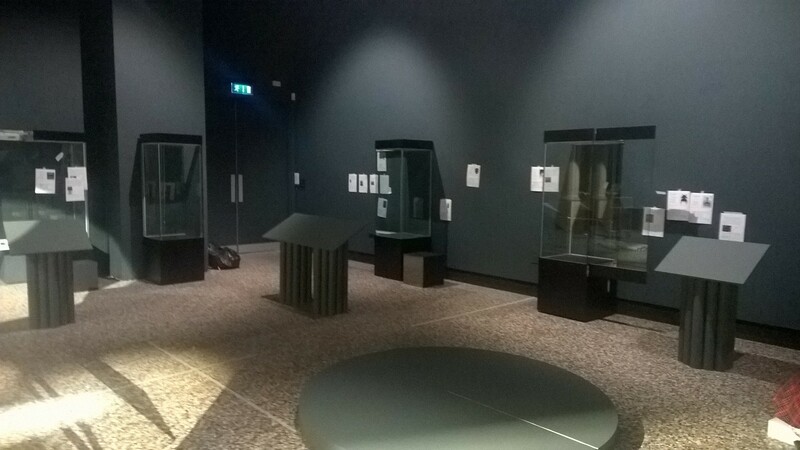 looks fabulous, thanks to all the hard work that the teams at Bowes put in; here’s a little preview of the finished exhibition space for SOLD!….hope it whets your appetite to visit – it runs until the 5th May 2019, so there’s plenty of time to take a trip ‘Up North’, or ‘Down South’, or indeed ‘Across the Pond’ – I know that some of my colleagues from the USA are planning a trip in February! Anyway, here’s a photograph of the ’19th century antique dealing’ side of the exhibition space for SOLD! SOLD! Exhibition at The Bowes Museum. 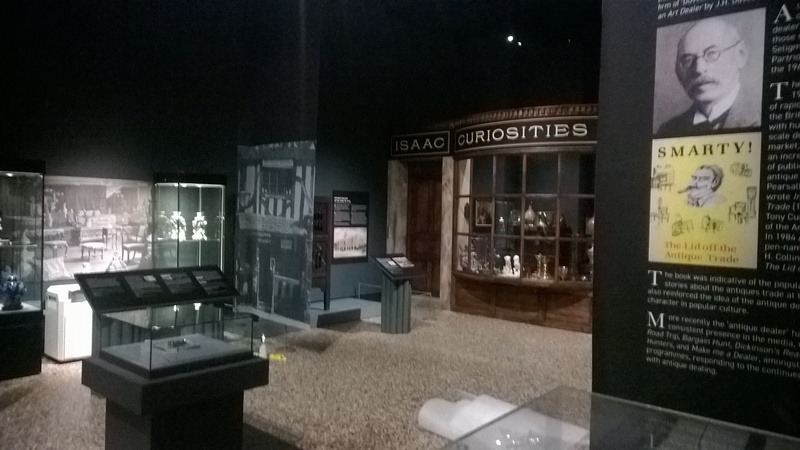 The ’19th century antique dealing’ side of the exhibition space. And another view towards the ’20th century antique dealing’ side of the exhibition space of SOLD! Corner of SOLD! 20th century antique dealing. And of course, the famous 1850 ‘Old Curiosity Shop’ finally took shape – it looks amazing!.. a special thanks to Julia from the conservation team at Bowes for her extreme patience with me as I painstakingly (or more probably I was being a pain!) asked her to constantly reposition the objects in the shop – Julia was, quite rightly, the only person who could actually handle the objects; and she had me, like an overactive film-set director, repeatedly saying, ‘Yes, looks OK, but can we just twist the object slightly, just a touch to the left…no, to the right…no, to the left again…’ (how annoying that must have been I don’t know!). And thanks too, to Simon Spier, my 1850 Shop project research assistant, would did great work with negotiating the private lender loans for the 1850 Shop – his skills of persuasion and diplomacy are now legendary!…Anyway, here’s the finished 1850 Shop. I modelled the 1850 Shop on a real ‘Curiosity Dealer’ shop of John Coleman Isaac, who was trading in Wardour Street in London during the 1820s to 1860s; it is now full of rare and wonderful things that would have been in a curiosity dealers shop in the period just before 1850. The 1850 Old Curiosity Shop in SOLD! 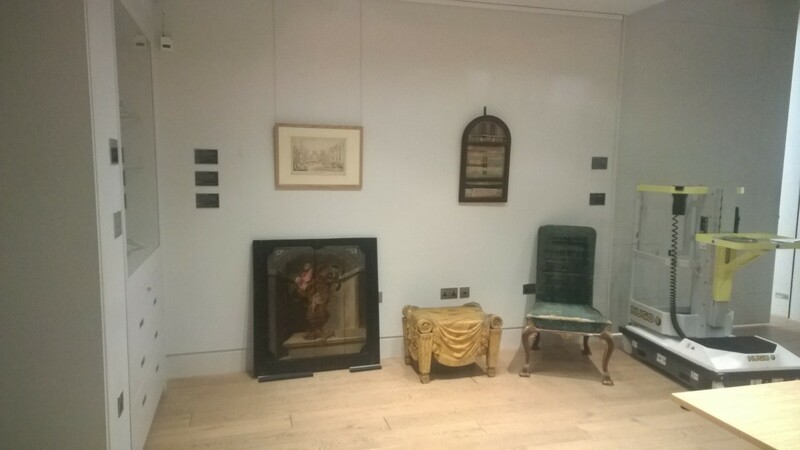 Here’s another view of the exhibition, looking across towards the 1850 Shop; we also have displays of rare antique dealer archives, catalogues and associated ephemera, to place these fascinating objects and the history of antique dealing into social and cultural contexts. There are many, many people to thank, and I hope I have included everyone below!.. (if not, do berate me with an email and I will give this little blog-post an edit!). Anyway, thanks of course, to Adrian Jenkins, the Director of The Bowes Museum, for agreeing to stage SOLD! And to Jane Whittaker, Head of Collections at The Bowes Museum, for all her help with assembling the very diverse range of museum loans – it was quite a complex task! And to the exhibition team at Bowes, George Harris, Catherine Dickinson, Vin Shawcross, Jen Chapman; to Simon Spier, my 1850 Shop research assistant – thank you Simon! and to the conservation team, Julia, Jon, Helen, Cecila, Linda, Laurie and Calum; to the curatorial team, Howard, Joanna, Katie and Bernadette; to Alison Nicholson in Fundraising, who did amazing work! and to the Marketing Team, Rachael, Alison and Leo – thanks especially to Alison and Leo who did brilliant work with the film crew on Friday and Saturday; to Rosie in Events; and Darren, in IT; to the front of house staff at The Bowes Museum – who generously put up with me; and the Education Team; and everyone in the Café at The Bowes Museum (the Welsh Rarebit is delicious!). And of course, all of the Sponsors of SOLD! – Tomasso Brothers Fine Art; Ronald Phillips; Tennants; The Furniture History Society; The Society for the History of Collections; The Paul Mellon Centre for the Study of British Art; Jonathan Harris; The Worshipful Company of Arts Scholars; The Anthony & Elizabeth Mellows Charitable Settlement; John Beazor Antiques; The University of Leeds. And to the many antique dealers and colleagues who helped with support for SOLD! – Lennox Cato, Apter-Fredericks, Martin Levy, Georgina Gough, Gary Baxter, Peter Finer, David Harper, Dominic Jellinek, Haughey Antiques, The Collector, Barnard Castle, Robson’s Antiques, Ingnet Antiques, Blagraves, Barnard Castle, and all of our lenders and supporters who wished to remain anonymous. And to our fantastic museum lenders – The Victoria and Albert Museum, London, The British Museum, The National Gallery, London, The Royal Collection, The Royal Armouries, The Museum of London, The Lady Lever Art Gallery, Liverpool, Temple Newsam, Leeds, and to The Bowes Museum for allowing me free (well free-ish) rein on their objects! And to our private lenders for loaning such a special range of objects for SOLD! Thank You All…it has been such a privilege to work with you all on this project. I hope that SOLD! stays in the memory for the longest time! SOLD! only 2 more days to go! The install gathers pace! The installation of SOLD! has been gathering pace the last two days, and with two more install days to go before the Preview Event on Friday the exhibition space has been a place of calm energy! The loan objects from the Victoria & Albert Museum arrived and have all been placed safely into their respective museum cases and plinths – the consensus was that they all look wonderful – here’s a brief ‘preview’ of just 2 of the V&A’s objects safely installed; the world-famous bronze statuette of Meleager by ‘Antico’ in his case, next too another very famous object, the George III coin and medal cabinet – to the left is the Bowes Museum’s ‘Eleanor Bowes Cabinet’. They are, of course, left to right – ‘Temple Williams’, ‘H.C. Baxter & Sons’, and ‘Phillips of Hitchin’ (the dealers that SOLD! 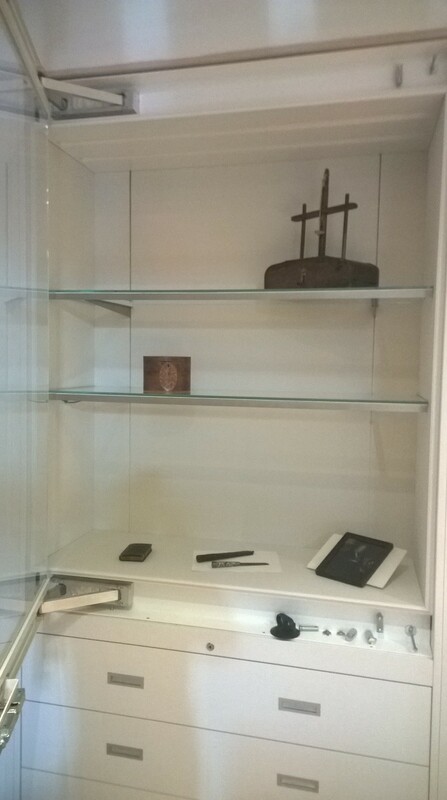 the objects to the museums). We still have to finish the displays of course and the labels etc…but hopefully it gives you a sense of what the final displays will look like – and will entice you to visit! Installation of the SOLD! exhibition at The Bowes Museum. There are also many more spectacular objects in SOLD! 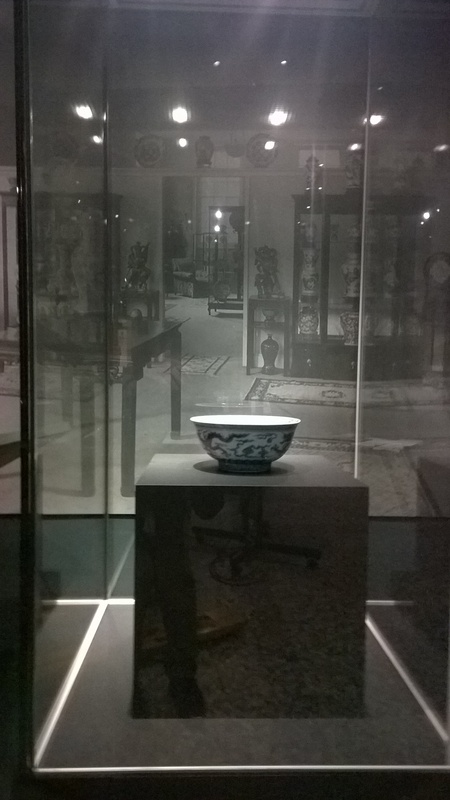 – including loans from the British Museum – here represented by one of the key objects, an amazingly rare Ming Dynasty ‘Palace Bowl’ (called the ‘Dragon Bowl’) dating from the 15th century – similar Ming Bowls were SOLD! by the world-famous dealers in Chinese Works of Art, ‘Bluett & Sons’. Here is the bowl, safely in its case. 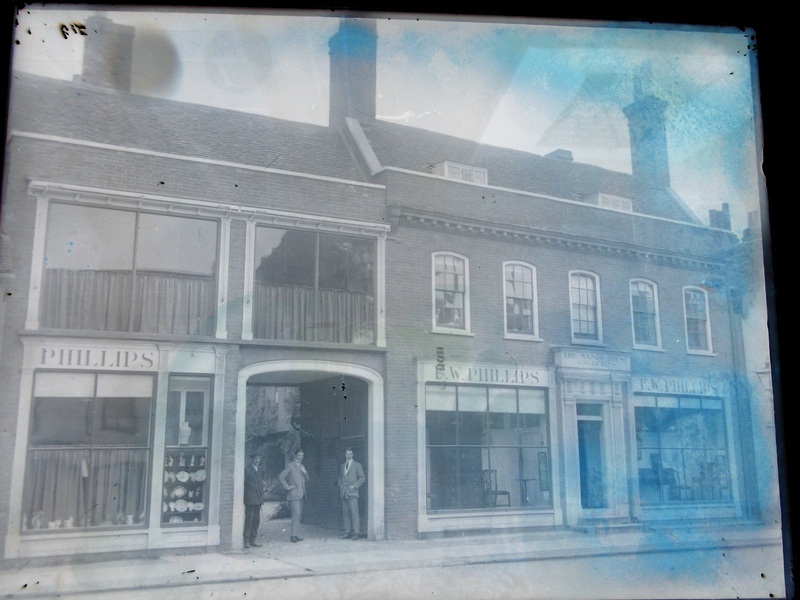 We have placed the case against an interior photograph of the shop of Bluett & Sons in 1926. The ‘Dragon Bowl’ installed in the SOLD! exhibition at The Bowes Museum. Jen, putting up the vinyl ‘floating quotes’ on the walls for SOLD! In the photograph, the exhibition space still looks a little bit like a ‘work in progress’, but then that’s exactly what it is! Today (Thursday) we are completing the ‘stocking up’ of the 1850 Old Curiosity Shop -it was slightly delayed yesterday with the careful unpacking and installing of the major loans from all of our key museum lenders – but we have our first objects in the 1850 shop! You can also see the fabulous range of ‘ancient armour’ ready to be placed in the 1850 shop on the tables outside the shop – the armour has been generously loaned by Preston Park Museum, Stockton – which has a truly amazing collection of arms and armour. The 1850 Shop in SOLD! The installation of SOLD! has continued apace the last couple of days – the exhibition is really beginning to take shape. 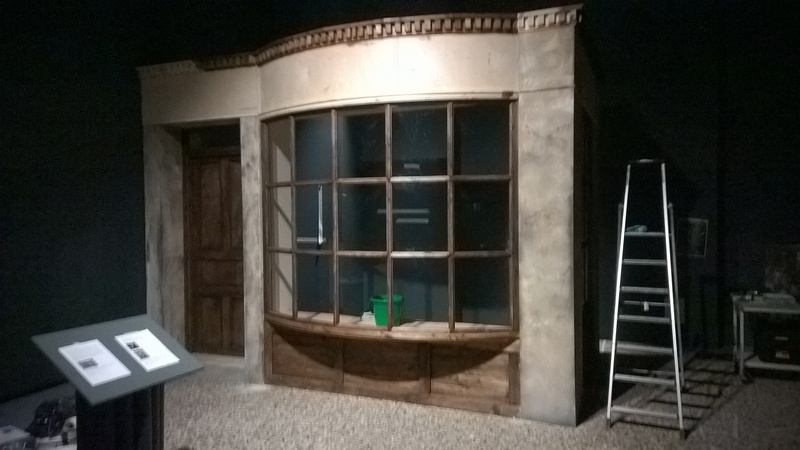 Viv and Ant completed the build of The 1850 ‘Old Curiosity Shop’ – it looks very smart, even before it gets a final paint finish and signboard. The 1850 ‘Old Curiosity Shop’ completed build, in SOLD! Vin quickly set about painting the signboard, ready for Catherine to put up the lettering for the Shop – you’ll have to wait until tomorrow to see what the sign says….the name over the shop is of a real ‘curiosity dealer’ and will be familiar to some people…but wait and see. Vin painting the signboard of the 1850 shop; with Jen inside the shop cleaning the windows. George, Simon and Vin (with a little bit of help from me) also began fixing the image panels and text panels for the interpretation for SOLD! 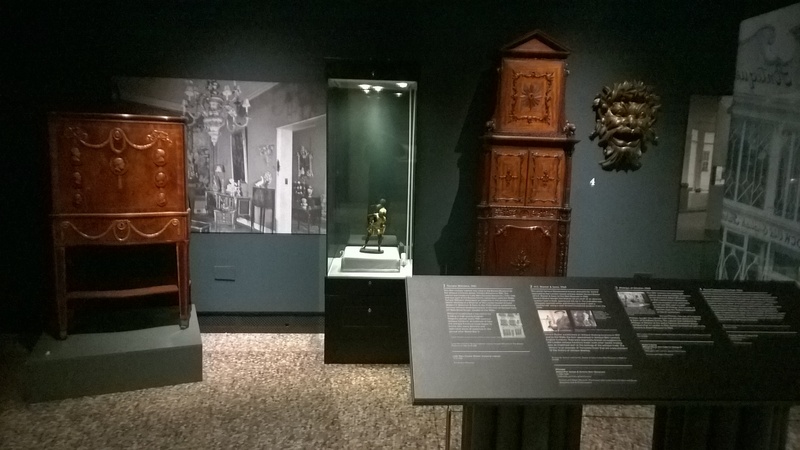 – it’s crucial that the interpretation helps to place the disparate range of ‘antiques’ into a coherent narrative, and I hope that the image and text panels will do that for the visitors. Anyway, here’s one of the image-text conjunctions. I’ve tried to make the interpretation of SOLD! like a ‘shopping for antiques’ narrative, with a constant rhythm of exterior images of antique shops, followed by an interior image…as if the visitor is walking down Wardour Street, or Bond Street, and popping into an antique shop….let’s see if that works for the visitor? Image Panel and Text Panel in SOLD! – this from the section on ‘Antique Dealing in 1870s to 1910s. The most exciting part of the installation of SOLD! 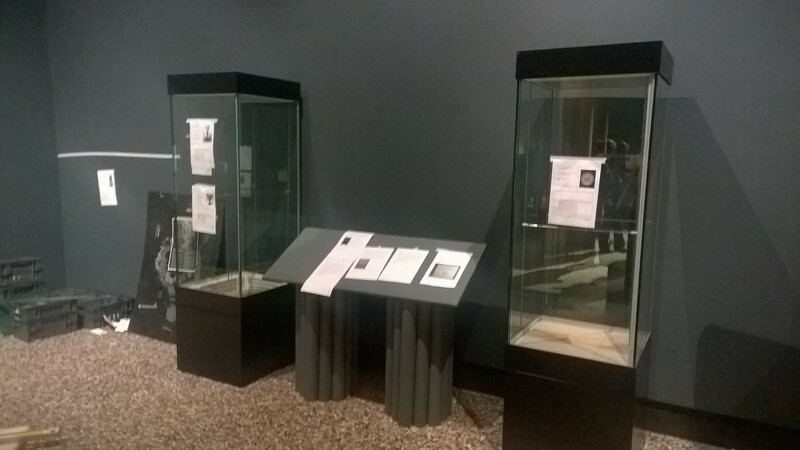 so far was when the first of the museum objects were installed. 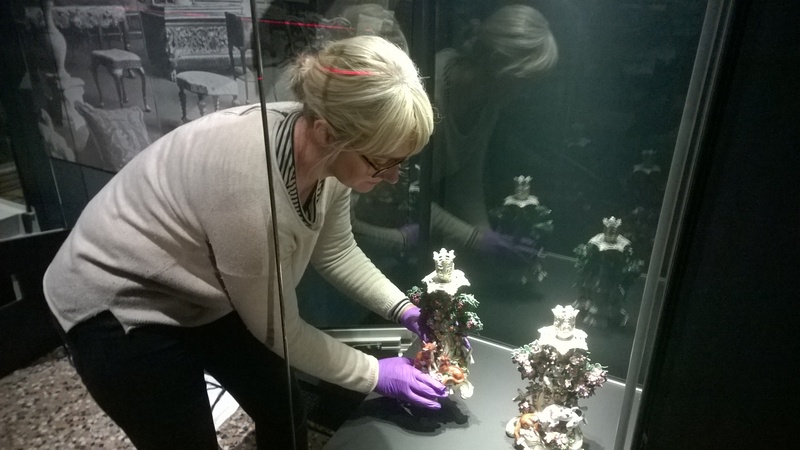 Julia and Calum, from the Conservation Team at The Bowes Museum, were on hand to carefully place the first of the objects – a pair of Chelsea porcelain candlesticks of the 1760s, which had been SOLD! by the ‘Dealers in Old Old English Pottery & Porcelain’ Stoner & Evans in 1918. 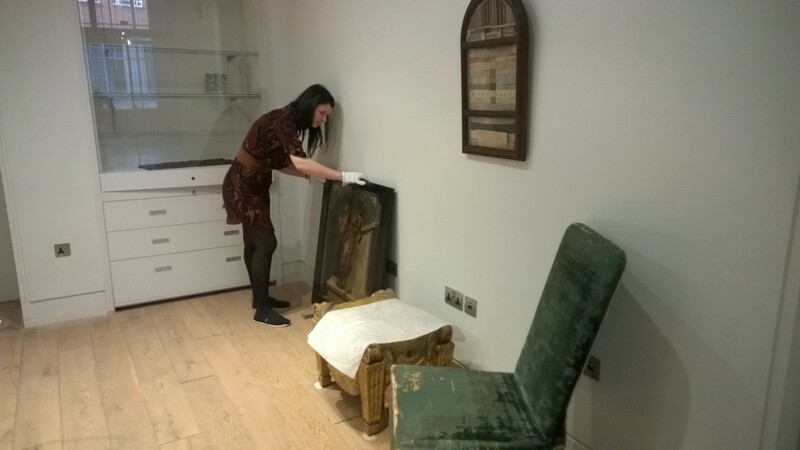 Julia, from Conservation at The Bowes Museum, installing the first of the museum objects in SOLD! Stoner & Evans in their glass case in SOLD! – there’s another glass shelf to be inserted into the case, which will then hold a copy of the Exhibition catalogue issued by Stoner & Evans for their ‘Old English Porcelain’ exhibition of 1909 at their galleries in King Street, London – just to give the wonderful pair of Chelsea candlesticks an appropriate ‘antique dealer’ context. 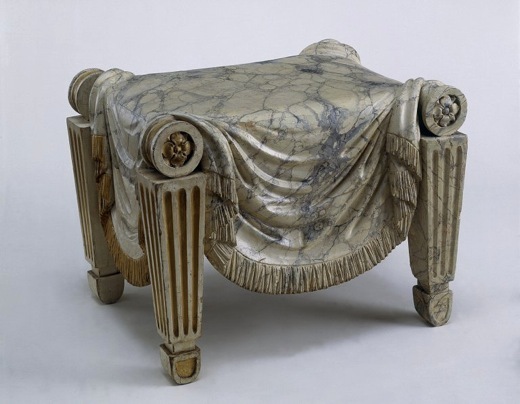 The first pieces of ‘antique furniture’ were also installed – one of the first objects in the exhibition is an 18th-century Sevres Porcelain-mounted table, associated with one of the most famous ‘antique dealers’ of the early 19th century, Edward Holmes Baldock (1777-1845) and was SOLD! in the 1830s. 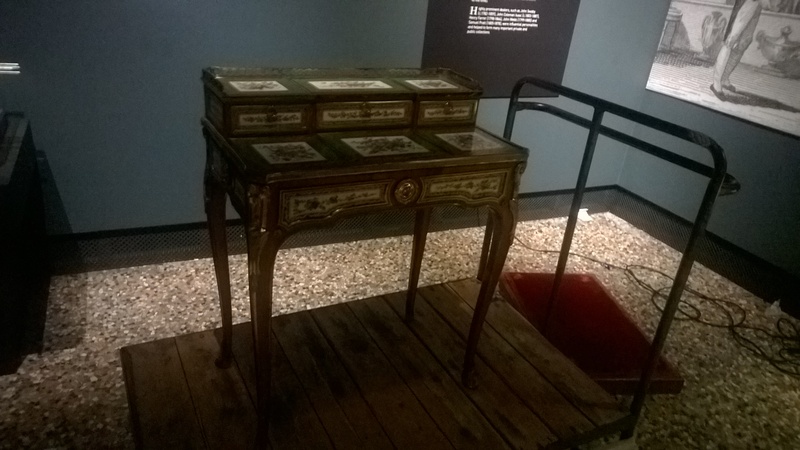 The table comes from the collections at The Bowes Museum (in fact all of the initial objects being installed yesterday were from the collections at Bowes). Here’s the ‘E.H. Baldock’ on it’s trolley, ready for careful positioning in the exhibition. ‘E.H. Baldock’ table ready for final installation in SOLD! 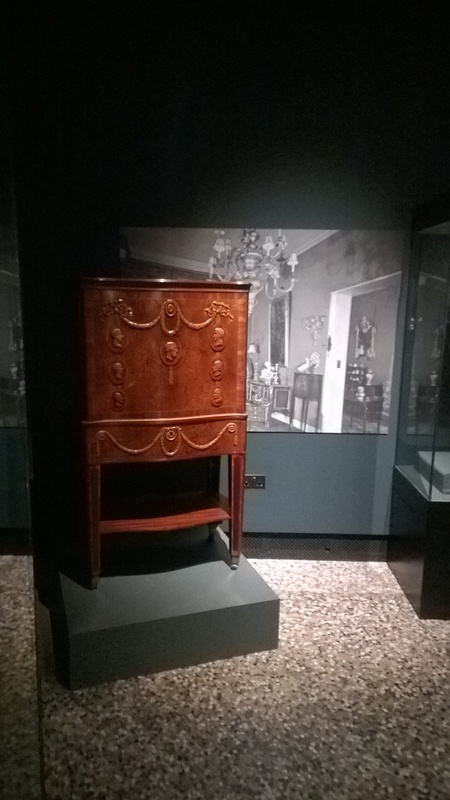 Another piece of ‘antique furniture’ was also installed yesterday – the famous ‘Eleanor Bowes Botanical Specimen Cabinet’ of c.1775-1785, and which had originally been in the collections of the Bowes family before it was sold in the 1920s, and then became a ‘museum piece’ in 1961, when it was SOLD! to the Bowes Museum by the well-known antique dealer Temple Williams. Here’s the ‘Temple Williams’ installed into it’s place in the section of SOLD! devoted to antique dealing in the period 1950s to 1970s. ‘Temple Williams’ cabinet, SOLD! in 1961 to The Bowes Museum. The installation of SOLD! continues tomorrow and Wednesday, when we start filling the 1850 ‘Old Curiosity Shop’…it’s going to be quite a task, but with the help of Simon, Julia, Callum, Catherine, George, Vin, Jen and Howard, I’m sure we will get it done! SOLD! The 1850 Shop Arrives! The SOLD! exhibition install has continued over the last couple of days – there’s only just over 1 week to go before SOLD! opens to the public on Saturday 26th January. There’s still lots to do of course, but George and the exhibitions team have been working long, long hours to ensure that the installation is all ready for the delivery of the exhibition loans from the Major, National Museums next week. There was excitement today (mainly from me!) when some of the main interpretation panels arrived from the design company – it was a bit like Christmas (again)…(for me)..
SOLD! 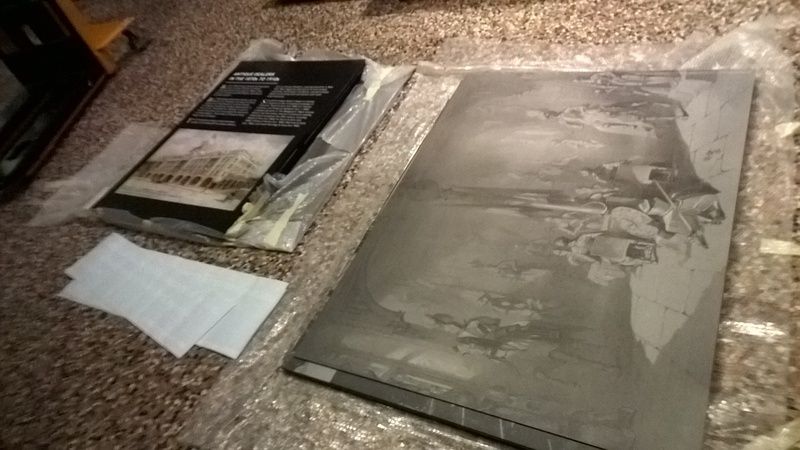 text Panels, as they arrived at The Bowes Museum. George, Vin and Simon, lining-up one of the text panels for SOLD! 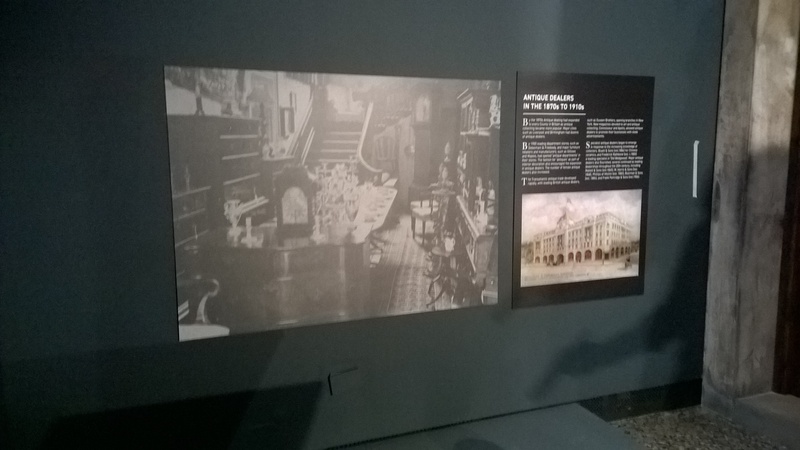 There are quite a few image panels for each of the 4 exhibition space walls – here’s a brief photo preview of the first corner of the exhibition space, focused on early 19th century antique dealers – with a fabulous image of an imaginary interior of an ‘antique shop’ of the c.1820s, culled from the business trade card of the real ‘curiosity dealer’ William Neate, who traded in the City of London in the period. This image is part of a series of interior images of antiques shops that form each section of the exhibition – a whole panorama of images of antique shops dating from the 1820s to the 1990s. One corner of the exhibition space of SOLD! Once the image panels were fixed to the walls by George and the team you could really get a sense of how SOLD! was beginning to take shape. One of the image panels fixed to the wall in SOLD! The image (above) shows an interior photograph of the shop of C. Charles dating from c.1900; (Charles Joel Duveen, was the brother of perhaps the most famous art & antiques dealer in the world, Joseph Duveen, 1st Baron Duveen). We have also used many more antique dealer shop interior shop images as part of the exhibition interpretation narrative, including the shops of J.M. Botibol (1950s), Bluett & Sons (1920s) and the shop of the famous 19th century dealer in ‘ancient armour’, Samuel and Henry Pratt’s ‘Gothic Armoury’ in Lower Grosvenor Street, of the 1830s. 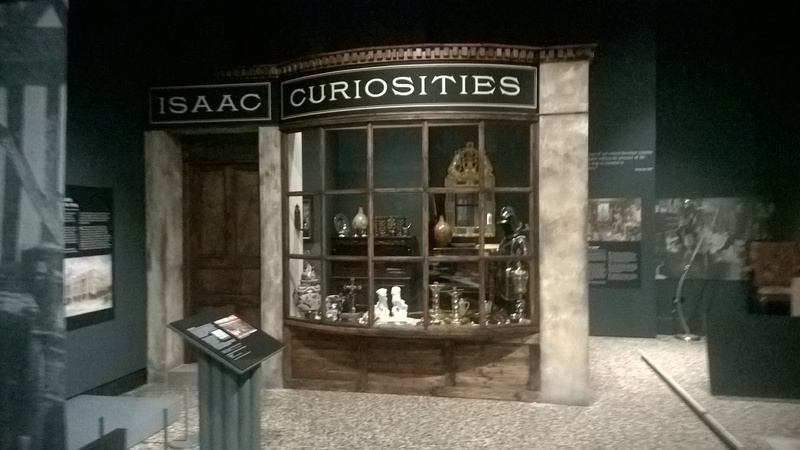 But one of the most exciting things to happen today was the arrival of the 1850 ‘Old Curiosity Shop’!…Viv and Ant, of North Exhibitions Services, delivered the Old Curiosity Shop to The Bowes Museum. 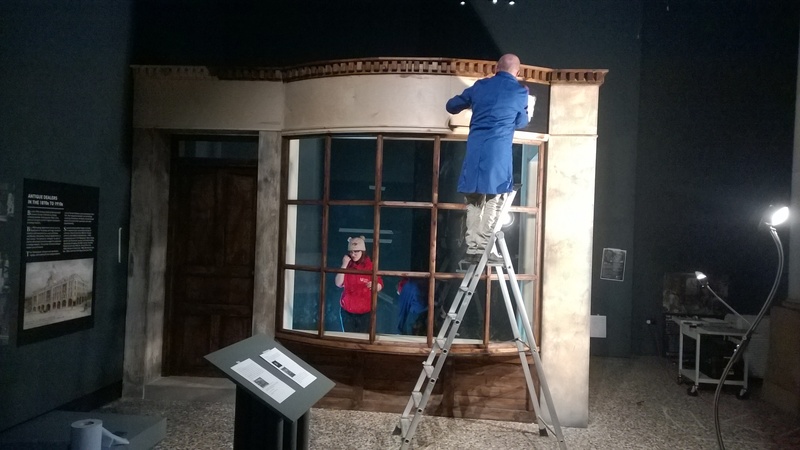 Viv and Ant have have been constructing the 1850 Shop in their workshops for the last few weeks – and everyone, including an endless series of helpers from the reception desk at The Bowes, helped to bring all of the (seemingly endless pieces) of the shop into the 1st floor exhibition space. Vin and Ant, with Viv obscured behind the right-hand pillar. Once the 1850 shop was in the exhibition space, Viv and Ant quickly set about assembling it – I think it will look spectacular…but as I had to leave The Bowes Museum at 5pm today I only got to see the uncompleted structure…but even so, it was certainly beginning to look amazing – below is the effect once the lower front wall of the shop had been completed. The 1850 Shop, taking shape in the SOLD! exhibition. There was still a great deal of assembly work to be done when I left the museum at 5pm….but I’m absolutely sure that the 1850 Shop will be ready and waiting for me and Simon tomorrow morning. And that, with the rest of the team at Bowes Museum, we’ll be able to begin to fill up the 1850 Shop with some extraordinary ‘curiosities’ tomorrow! 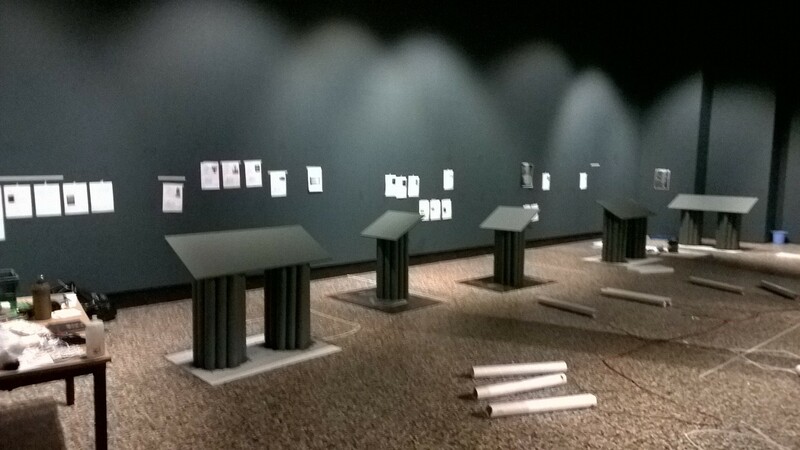 The installation of the display cases and the design of the exhibition gallery for SOLD! continues apace. 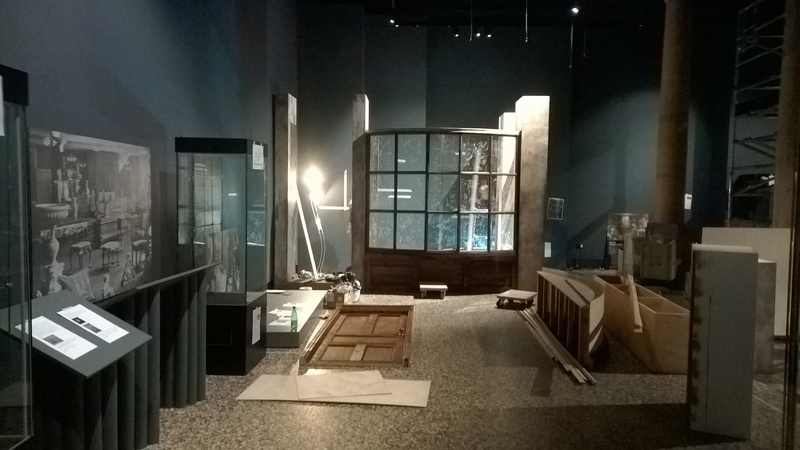 It’s certainly taking shape now and looking much more like an exhibition now that the museum display cases are being put into position. 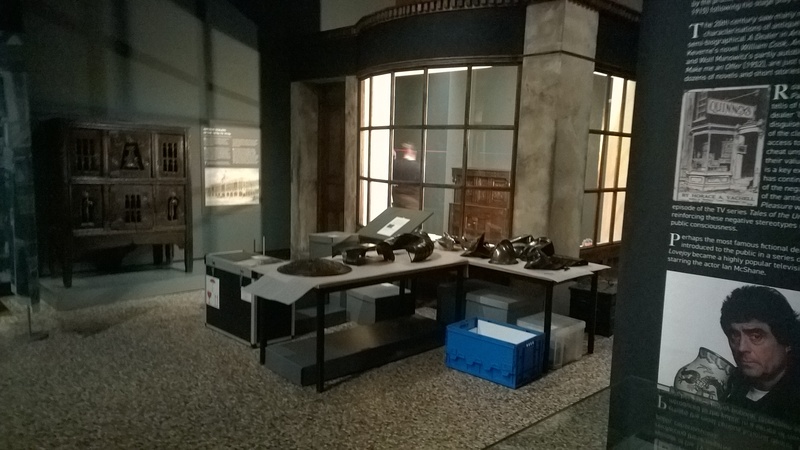 Here’s the ’19th century antique dealing’ side of the exhibition space, with the cases ready for the objects coming from the V&A Museum, Tower Armouries, and the British Museum. There’s still an awful lot of work to do of course, but most of the painting has been completed and we are assembling and installing the security cases – you can get a real sense of how the objects will look once they are all safely ensconced in their respective cases – the consensus is that it’s looking good! The ’20th century antique dealing’ side of the exhibition space (see below) will have some fabulous objects – including the ‘poster boy’ for the SOLD! exhibition, the ‘H.C. Baxter & Sons’ ‘Antico Bronze’ on loan from the V&A Museum – and thanks to Gary Baxter, the grandson of Horace Baxter, who sold ‘Antico’ to the V&A Museum in 1960, we now have a fabulous photograph of Horace Baxter in 1960, holding ‘Antico’ – you’ll be able to see the photo alongside ‘Antico’ in the exhibition. SOLD! 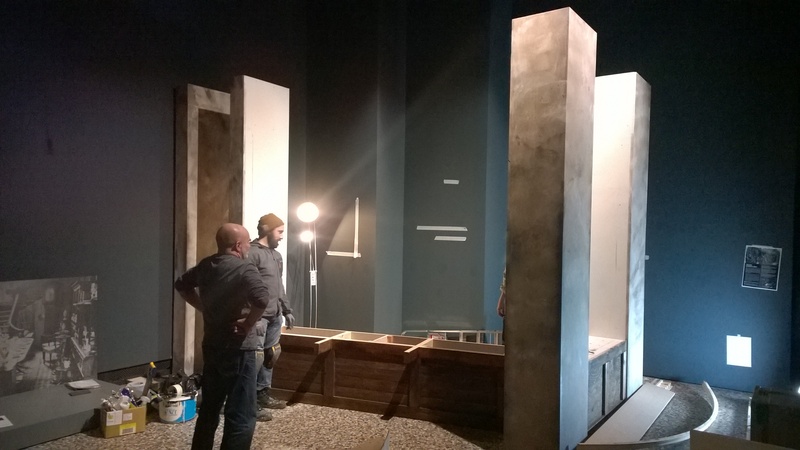 install – 20th century antique dealing side of exhibition space. George and the exhibitions team are still working like Trojans to get SOLD! 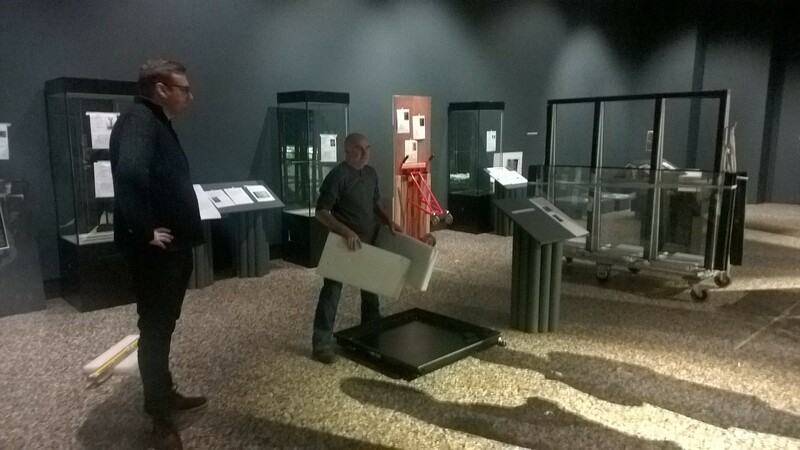 finished on time – we had extra help today when Darren (Bowes Museum IT specialist) stopped by to help out – here’s Darren, with Vin, pondering where to put the display case for the ‘ancient suit of armour’ that’s coming from The Tower Armouries in London. Darren and Vin, installing exhibition cases for SOLD! And of course there’s tons of admin and emails to deal with as the process of object loans from our generous museum lenders comes to completion – the exhibitions team ‘office’ in on-site of course…right in the centre of the action – here’s Catherine, in the exhibitions team ‘hub’; she’s finished scraping the masking tape off the floor in the exhibition space and is now dealing with the hundreds of emails that SOLD! seems to generate! 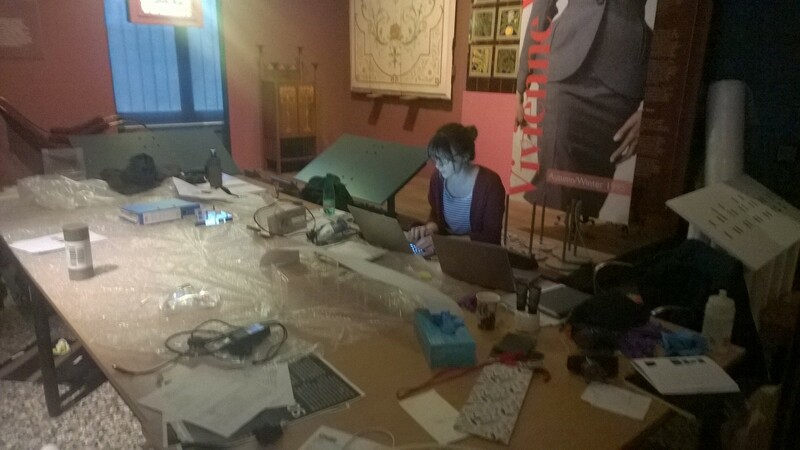 Catherine, working hard in the Exhibitions Team ‘Hub’! More updates on the progress of SOLD! soon…the 1850 ‘Curiosity Shop’ is being constructed on Thursday! SOLD! Exhibition – the final push! It’s all hands on deck for building and installing the design for the SOLD! exhibition at The Bowes Museum – only 2 weeks to go now before SOLD! opens! The Exhibition is live on The Bowes Museum website – see SOLD! Over the past few weeks all of the exhibition interpretation panels and the object labels have been composed, and all the exhibition image panels have been decided – the ‘proofs’ of the interpretation and image panels came back from the designers this week – the consensus is that they look great! – We’re not showing you them of course (yet)….you’ll have to wait and go to see SOLD! I couldn’t believe how hard the exhibitions team at The Bowes Museum work during the process of taking down the previous exhibition (a fabulous exhibition called ‘Catwalking: fashion through the lens of Chris Moore’) and installing the next exhibition (SOLD!) – it is pretty much a 24 hour a day job…with all the work concentrated into a few short weeks. 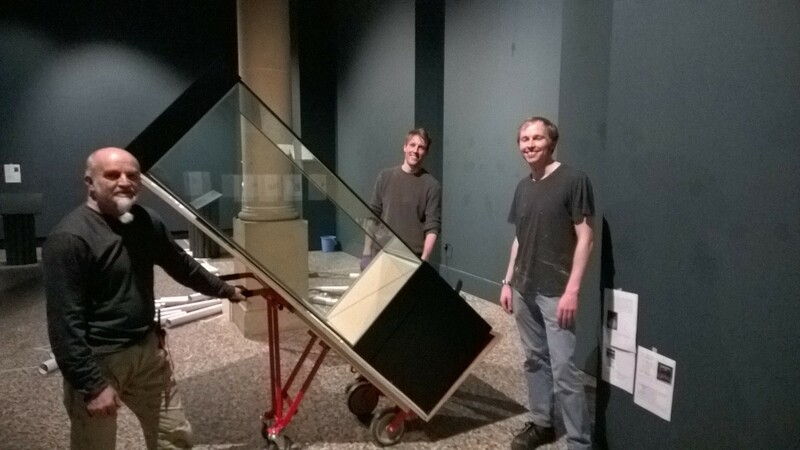 Here’s Vin, Simon and George starting to move the museum cases into the main exhibition space at The Bowes Museum, ready for the museum objects arriving. Vin, Simon and George, installing cases for the SOLD! exhibition. The exhibition space is starting to take shape – we’re starting to ‘place’ the exhibits in the correct order in the space; below is a photograph of one side of the exhibition space with photocopies of the object interpretation panels, fixed to the walls with masking tape, indicating the location of each object in the exhibition. We’ve gone for a dark grey and black colour scheme (which seems to be very fashionable for exhibitions). The exhibition space might look a bit messy in the photograph, but on the day I took the shot, we’d only just finished taking down the thousands of cardboard tubes that were part of the Catwalking exhibition – you can see a few remaining on the floor – I don’t think I ever want to see a cardboard tube again! 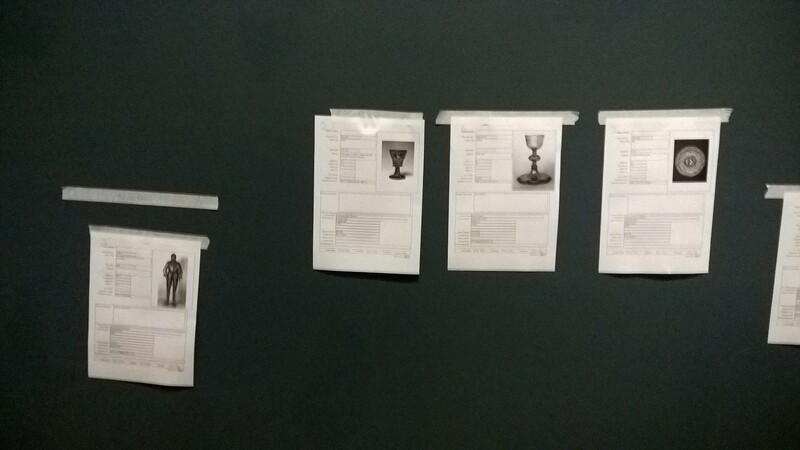 Here we have another photograph (below) of one of the walls in the exhibition space, with the photocopies of information on each of the objects in the exhibition, placed near to where the object will be situated – in this section of the exhibition, which focuses on 19th century antique dealers, you can see how we are placing the museum loans in sequence – the suit of ‘ancient armour’ sold by the dealer Samuel Pratt to the Tower Armouries in London in 1840; the 15th century Venetian glass goblet, sold by the dealer Henry Farrer to the South Kensington Museum (now the V&A Museum) in 1854; the 15th century silver-gilt chalice sold to the British Museum by the dealer John Webb in 1855; and the 16th century ‘Raphaelware’ dish sold by Henry Durlacher to the South Kensington Museum (now the V&A Museum) in 1857. SOLD! 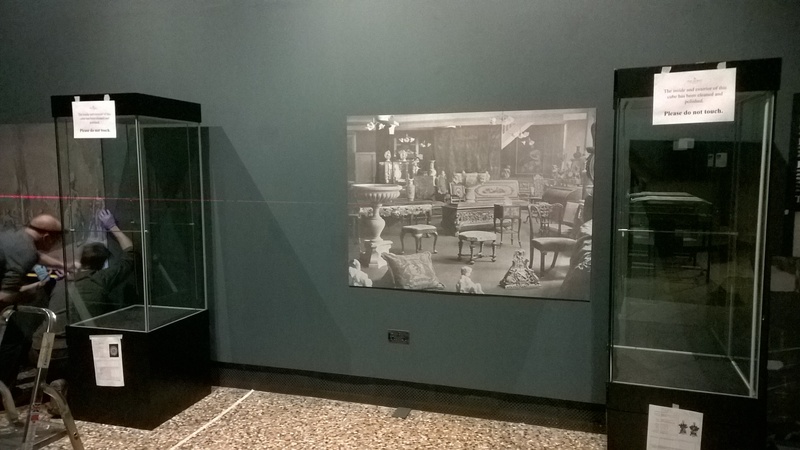 install at The Bowes Museum – object placement labels. And as I say, it was all hands on deck for the short time frame to take down and then install exhibitions – here’s Jen and Sarah helping out in re-painting one of the plinths that is going to be used for SOLD! Jen and Sarah repainting a plinth for the SOLD! exhibition at The Bowes Museum. 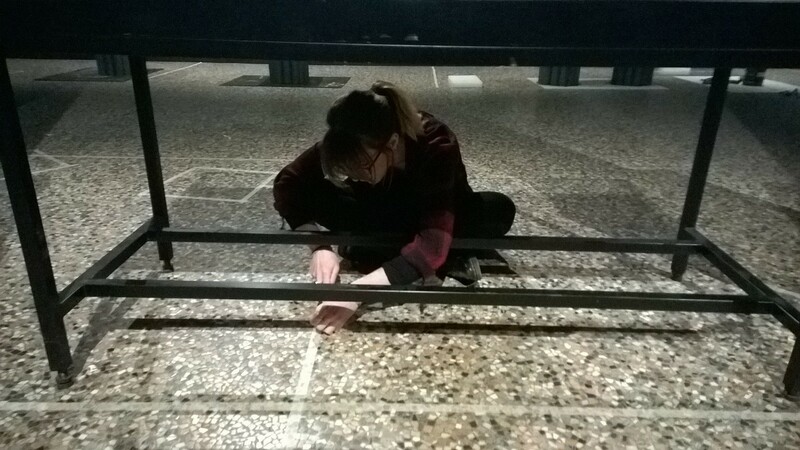 And Catherine (below) carefully removing the masking tape which had been used in the previous exhibition from the floor. Catherine, in deep concentration, carefully removing masking tape from the floor in the SOLD! exhibition. It was an exhausting day, but it’s thrilling to see all the hard work coming to fruition. Next week the install continues, and we have the exciting prospect of building and fitting out the ‘Old Curiosity Shop’ of 1850 in the exhibition space – Simon and I, and the rest of the Bowes team are really looking forward to that! 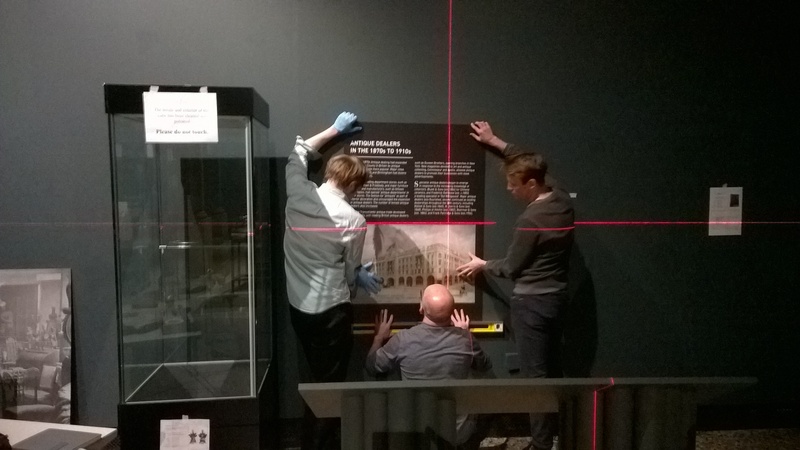 Watch out for blog posts on ‘behind the scenes at the museum’ next week as the installation of SOLD! continues!